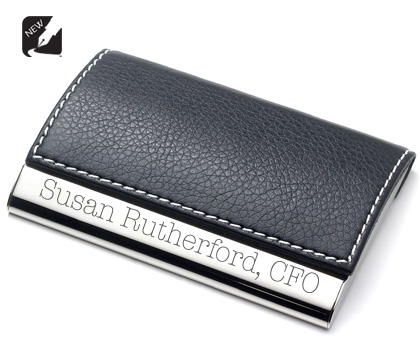 This black business card holder has a double sided magnetic strip making opening and closing a snap! Its sleek steel bottom has plenty of room to engrave even the longest of names while the soft leatherette top is soft to the touch. Dimensions: 2 7/16" x 4 1/8" x 5/8"